Stack is a popular dice game with easy to follow rules and plenty of adaptability. You can buy official Stack dice sets or use existing dice, so long as you have enough for everyone and have matching colours. For most people, Stack sets are the easiest choice and there are plenty of varying types available on the market. In order to play stack, it is ideal to have between two and four players. 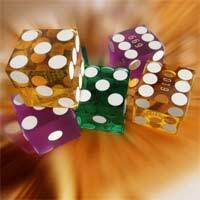 Each player must choose a set of dice and there are always 14 dice in each set. All you need to do is choose which colour will be yours and you must stick with that colour for the entire round. As in many card or dice games, the person who gets the highest number must go first, so each player should roll one die to determine this. In Stack, if you roll a number one, this equals ten points and is in fact the highest score available. This is because in Stack you are awarded points dependent on a straight forward scoring system. All dice are awarded points at face value, other than the one, which is awarded ten points. Play begins and proceeds clockwise and everyone is ultimately trying to win the game by obtaining the highest score. The beauty of Stack is that you really only need the dice and a flat surface to play on. You can play the game anywhere that is capable of handling everyone throwing their dice at the one time. Once everyone has thrown their dice, check that they’re all showing one face clearly and aren’t on top of each other. You must try to keep them spread apart so that they’re not touching, but also try to keep them inside the central playing area. The player who rolled the highest value dice at the beginning starts play. They can use any one die from their entire set and stack it on top of any opponent’s dice that has the matching number. You must keep the number facing upwards, so for example if you choose a five and put it on top of another five, make sure your five is still the face value that is showing. You can’t stack on top of your own coloured dice and you can’t move a stack once it’s started. This means you have to be very careful with your choice and always ensure your hand stays on the dice. If you remove it, it’s turn over and you can’t pick one die then change your mind and try for another. As you build your stack, you can build it up to four dice on top of each other. If any of your colours are on the top of the stack, these are potential points for you. When you place the fourth dice on any stack, the stack is now your property and you can remove it from the playing area. You then get the points from this stack at the end of the game. During play, it isn’t mandatory to immediately stack the die you’ve chosen. You also have the option of rolling the die chosen and whatever number comes up must then be played. This can be handy if you’re waiting on a specific number, but if you roll and there’s nowhere to stack, your turn is over. Stack has numerous penalties imposed throughout the game in order to give it more structure. Primarily if you knock over a stack by accident, you will lose your turn and also have points deducted from your score. You’ll roll one dice and whatever number is on it will be removed. You also have to rebuild the fallen stack and if you can’t, you’ll lose another ten points. If you attempt to make your shot when it isn’t your turn, you lose that turn and must wait until the next round. If you pick another players dice up by mistake, you will also lose a turn. The game play continues until a player a stacked their last dice. You must at this stage let everyone else know that you’re about to ‘go out’. At this stage, everyone else may play for another turn and then everyone will count their score. If one player stacks on another’s last unstacked dice, it’s the end of the game for those players. The others may continue on for one more round. At this stage you must count your points. If you have any stacks with your colour on top, these are your points to take. You can play Stack to any number you wish, many people choose to play until one person has over 100 or 200 points. Remember, you can also count stacks of two or three, not just four, so long as your colour is on top, that stack is yours.